Hello, lovelies! How’s your March going? We’re starting get signs of spring and I feel like my creative juices are flowing! I’ve been brushing up on old techniques and sorting through my stash and it feels so good. If you remember, one of my New Years resolutions this year was to go back and review all of the patterns I have available in my Etsy shop. I’ve been designing them for, gosh, at least 7 years now? And since my pattern-writing and diagram-creating skills are entirely self-taught, I worry that the quality of my patterns is a little inconsistent. I know for a fact that my photography has gotten better, specifically. So this has been a great opportunity to switch out photos and spruce up patterns, so even the oldest ones represent my “brand” the way I want them too. So, first off is the easy one – I made another sample for my St Peterburg Ombre Cuff. This one is narrower than the examples in my pattern and it isn’t really “ombre” at all. It’s just some rose-gold and peachy colors that I liked together. I… obviously didn’t tweak the written pattern at all. In penance for taking the easy route with a pattern I’d so recently written, I decided to do my Buta Bracelet next. I used ZoliDuo’s in the “Chalk Alabaster” color, which is a weird mottled tan kinda color with dark browns, gray/blue crystals, and a hint of purple. It turned out fine. I realized after I made it, that I need to try this pattern with PaisleyDuo’s to see if there’s any chance that they are interchangeable with the Zoli’s. I really, really doubt that it will work, since the PaisleyDuo’s are significantly larger, but I need to give it a try just to make sure. Can I tell you a secret? I don’t really like this pattern. It sells alright and people seem to enjoy making it, but… I don’t know. It just doesn’t tickle my fancy and I don’t love working with the ZoliDuo beads. The Right and Left thing feels like a money-grab and I still think they’re drilled inconsistently. I double-checked the pattern and it seems to be legible and I think my photos hold up, but it… just doesn’t feel like me? Style-wise, it’s not my favorite work, I think. But hey, I’m sure there are bakers out there who don’t like lemon and still make a great lemon meringue pie, so I guess I don’t have to personally love every single thing in my shop, right? So, here’s the Big Thing that took up most of my month. I re-did my Double Split Ring Pattern almost from scratch. This poor thing desperately needed new photos. This was the old cover photo and thumbnail. Yikes. Like, I still love that bracelet and those colors, but you can’t even see the beaded part because of my dumb info boxes. And the photo itself is so dingy and dark – this was before I knew anything about photo editing. But, if I was going to take new photos, I needed to make new samples, since I sold the old ones years ago. I raided my rondelle stash and got stringing! What I really love about this pattern is that it’s my only non-beadweaving tutorial. It’s just strategic stringing and a few basic knots and probably my best pattern for beginners. It’s just on cord, so it goes So Much Faster than any of my other designs. I loved playing around with the color combinations and trying to get different effects with cord color and which tone of metals to use. The copper and beige one is definitely the most me, but the white and light blue was a real color adventure and I love how the turquoise, silver, and bronze one came out. I went into the pattern and swapped out the cover photo. I also re-wrote the materials list to match the current style I use in my newer patterns. 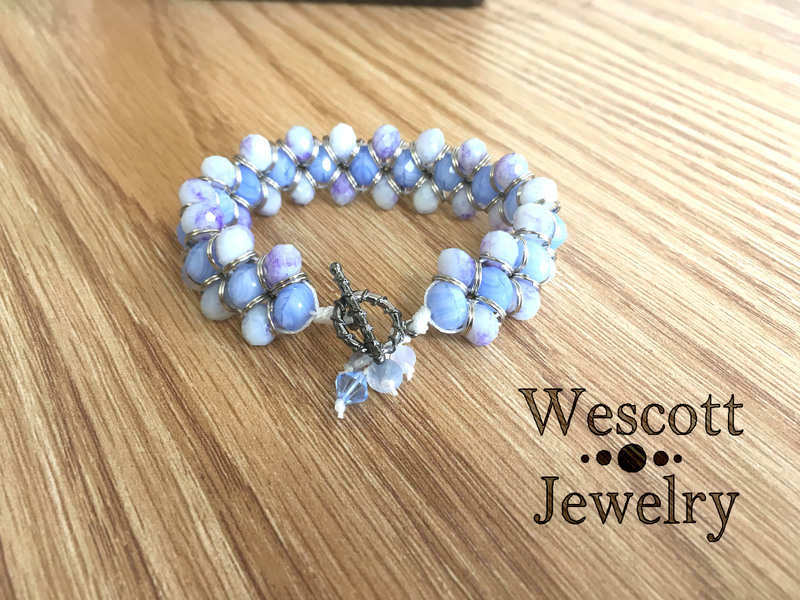 I also put in a bunch of tips that I’ve learned doing this bracelet over the years – like using Fray Check to keep the S-Lon cord from unfurling. 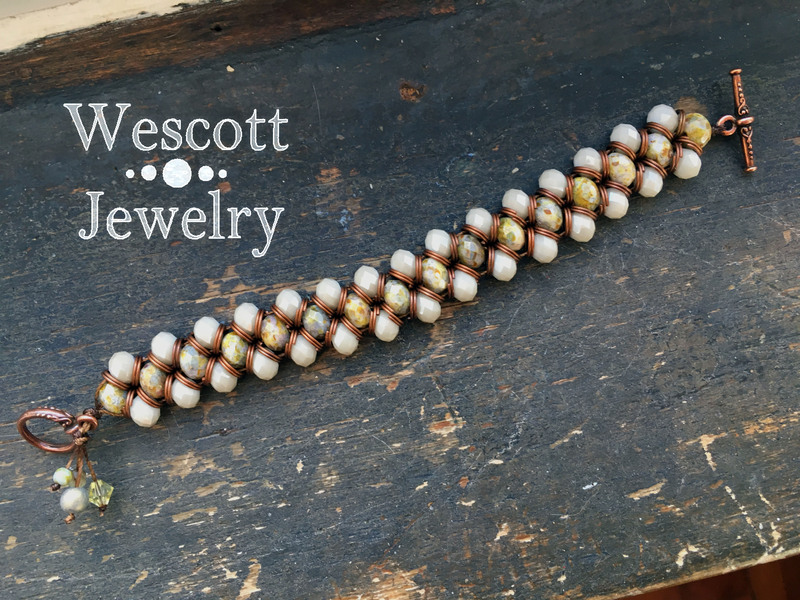 I re-listed the pattern just before I typed this up and I also decided to bring the price down just a tad, because it is so much simpler than my bead weaving patterns. If I’m going to charge more for longer, more complicated patterns, than the reverse should also hold true, I think. It was really, really fun to revisit a pattern I wrote over 5 years ago and remember how much fun it was to develop. And now when people buy the pattern, I don’t have to worry about them not knowing how long ago I wrote it and thinking the pattern looked messy or unprofessional. It can be hard to justify going back and prettifying old patterns when I could be writing new ones, but I’m really pleased to challenge myself this year to go back to my old babies and make sure they look their best. 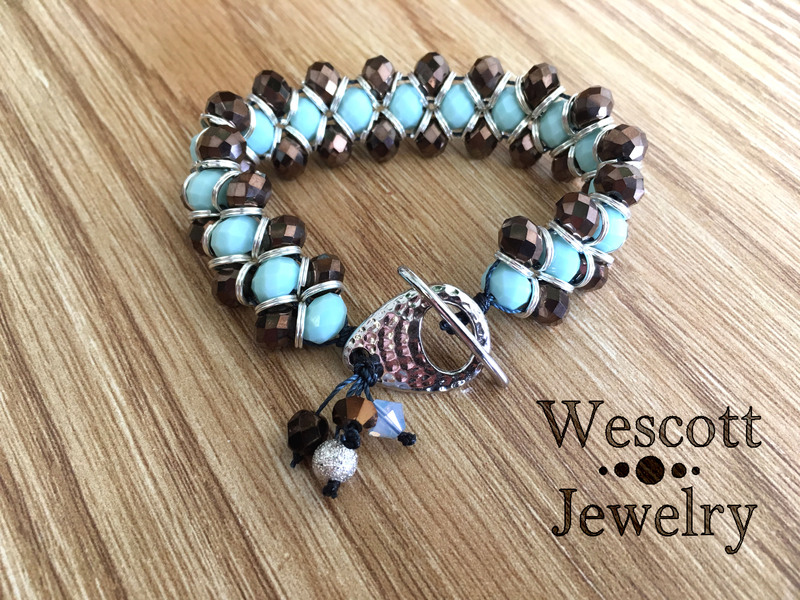 This entry was posted in Beading Techniques and Experiments and tagged bead patterns, bead tutorials, beading, beading pattern, beading patterns, beading tutorials, beads, beadweaving, beadwork, beginner beading, etsy, stringing beads, wescott jewelry. Bookmark the permalink.